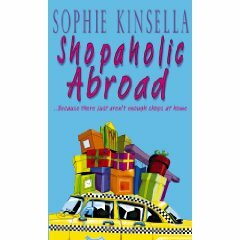 Shopaholic Abroad by Sophie Kinsella – It's Time to Read! Will travel broaden the mind…or just loosen the purse strings? This is the second installment of the Shopaholic Series, and just as fabulous as the first. However, it is very similar to the first book. Does that spoil the story? Not at all! Becky is taken to New York by Luke, and ends up spending a ton. She is in a whole heap of debt – and soon her secrets become known to everyone when the Daily World exposes her. This story is full of all the usual antics – shopping, friends, Luke, embarrassment, love and debt. The storyline is similar to Confessions of a Shopaholic and how Becky spends too much shopping, and has to work her way out of debt. There is a lot of time spent in London too, which I was surprised about – in fact, most of the storyline was based in London, which is one of the downsides of this book. However, I love this series! Becky is self-obsessed and a bit irritating but I still didn’t want anything bad to happen to her and rallied behind her when horrid things happened to her. And I loved Suze – I want a flatmate like her! She is so lovely, looking out for Becky as well as pursueing her own career. I enjoyed the story – it was fast-paced, predictible and fun. I love Kinsella’s writing, fluid and enjoyable. Yes it is chessy and very girly, but I loved it! This is an easy read – and I highly recommend it. And I love the ending! I am looking forward to the next installment!